3 November 1873 the steamship Weser arrived in New York City. Focke Goldenstein was on board. As we saw in an earlier blog post, Focke’s father had written a letter in support of his immigration in September of 1873. 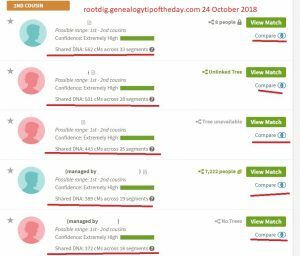 In that post, I indicated that Focke probably never saw his parents (Johann Lucken and Tjode Anna Focken (Tammen) Goldenstein) again. It appears that I was wrong. 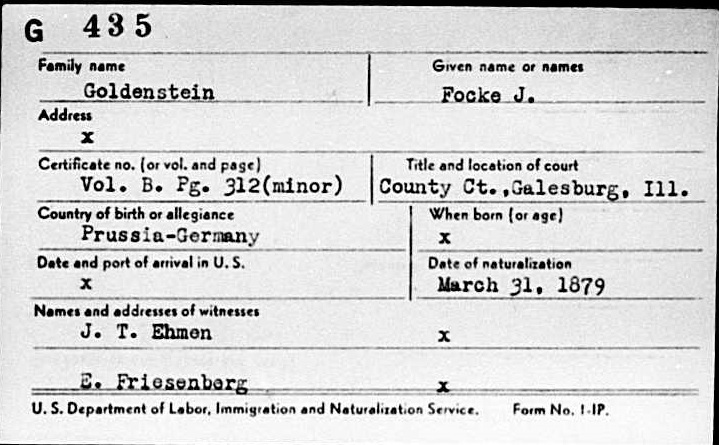 A complete search of New York City passenger manifest entries located another entry for Focke Goldenstein. This one was in 1879. The 1879 manifest of the Oder stated that twenty-one year old Focke Goldenstein was headed to the United States and that the country to “which they[sic] severally belong[ed]” was also the United States. This would imply that Goldenstein was already a United States citizen at the time he arrived in New York City on 17 October 1879, either by birth of naturalization. 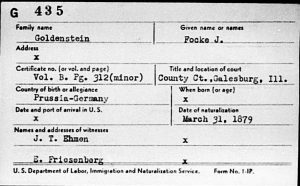 The question is: how many United States citizens are named Focke Goldenstein who would have been twenty-one years of age in 1879? This age is fairly consistent with the date of birth for the known Focke Goldenstein which was 12 January 1857 in Wrisse, Ostfriesland, Germany. The known Focke would have been twenty-two at the time the Oder landed in New York. The difference is not significant. Extensive research on the Goldenstein family has not located any other Focke Goldenstein in the United States before 1880 other than the one I am researching. There is a Folke Goldenstein, but she’s younger than Focke and is a female. There are other Focke Goldensteins who immigrate to the United States several decades after this one. Those Fockes are nephews of the one I am researching. The known Focke Goldenstein became a naturalized citizen on 31 March 1879 in Knox County, Illinois. The “index card” is used as an illustration in this post, but the actual naturalization record has the same date. As the card indicates, Goldenstein’s naturalizat ion was a “minor” naturalization. This only means that he was a minor at the time of his immigration to the United States, not that he was a minor at the time of his naturalization. Minors could not be naturalized of their own accord. Individuals who immigrated as minors were subject to a slightly different time frame for naturalization than were individuals who immigrated as adults. It is noted that Goldenstein apparently naturalized shortly before he apparently made a return trip to Germany. This likely is not coincidental and could have been done to avoid being drafted into military service while overseas. This entry was posted in Uncategorized and tagged focke goldenstein. Bookmark the permalink. My great great uncle went back to Germany to settle his mother’s estate in 1860. He was naturalized about the same day he got his passport. His mother had brought 4 sons and 2 daughters to America so the boys wouldn’t be conscripted. Their father had died from wounds in some war. As you say, he wanted to go as an American citizen so he wouldn’t be taken into the army when in Germany. Was Golden, IL named for the Goldenstein family? No. That is merely a coincidence. Thanks for working in that Focke translates to John. Those of us who are focussed on Scotland probably don’t know that…I didn’t, at least! No–the Johann was his father. Focke really doesn’t have an English version. This man used Frank some of the time in the US but generally went by Focke. Is this Focke Goldenstein related to the Goldenstein’s in Golden, IL? Yes he is. He died there in 1913. Most of the Goldensteins in the Golden area descend from one of his two sons who stayed in the area.